Clare didn’t wait for the man’s reply. She lunged out of bed and bolted from the room, disbelief and rising panic making it hard for her to breathe. One thought burned in her mind as she grabbed her handbag and headed for the back door. If her ex-husband had made good on his threat to take Tyler from the hospital, she would never, ever forgive him. 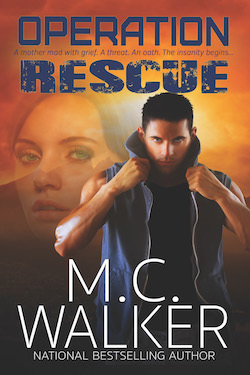 Operation Rescue was originally created for the mainstream market, but was edited for the Christian market to give fans of inspirational novels an exhilarating reading experience with a message of faith at its core. If you would prefer the original “director’s cut” mainstream version, Operation Hero by Miriam Minger is available at your favorite online bookstore.